BUGS is a HUGE disappointment. This was one of my must see film at Tribeca and five minutes in it was one of the must miss films of the festival. The film is nominally a couple of guys looking into whether or not insects can be used to feed humanity over the coming decades. We watch as they talk to people, eat bugs and contemplate the future. What the film is in reality is a mess. A rambling unfocused film that tells us little about anything. We really don't what the guys are doing beyond a basic level since we are never told. They bounce to various countries then back to the food lab where they kind of talk about things before back to new countries. The problem is that nothing is put in context. Everything just sort of happens and anything meaningful is left to an odd sound byte of is buried in the middle of a technical discussion that we come into the middle of. I have no idea what the what the point of any of it is. 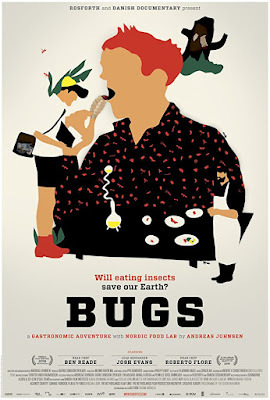 If things weren't bad enough the film cuts its own throat regarding the rush to find a viable way to feed the masses with insects by stating that not only are we capable of feeding 12 billion people if we wanted to, but that the guys aren't sure how they would feel if insects were a business. If that's the case why are they making finding a food source a priority? On the upside watching the insects is pretty cool, with the giant wasps in Japan being damn right scary.